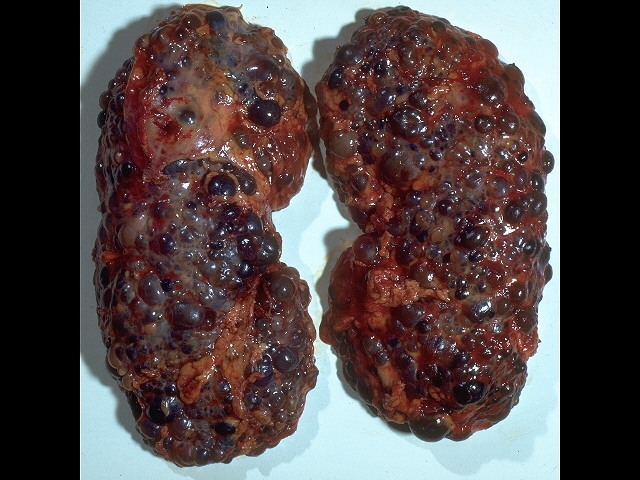 Polycystic kidney disease is usually referred to as autosomal (auto-zo-mull) dominant polycystic kidney disease, or ADPKD. Autosomal refers to how the condition is inherited; it is passed down from one generation to the next, and a family member has a 50 percent chance of developing it. In ADPKD, many fluid-filled sacs called cysts are found in the kidneys; some cysts can be located in the liver, as well. There are two types of ADPKD. The first type, referred to as PKD1, is thought to be a more aggressive form of the condition. Those with PKD1 are thought to progress to end-stage kidney disease faster than those with PKD2. That being said, as the cellular and molecular mechanisms of ADPKD are being researched, there may be significant genetic variance in PKD1. ADPKD is one of the most common inherited conditions responsible for kidney disease and patients needing to start dialysis. There is a significant amount of research going on as to the possible reasons that cysts form in the first place. I cannot say enough of the significant role and support of the PKD Foundation in educating and advocating for this disease. In ADPKD, the cysts can grow so large they begin to overwhelm the kidneys. As they get larger, the cysts can compress and squeeze the kidneys, as well as increase the size of the kidneys. High blood pressure can be a problem as the cysts continue to get bigger. The tremendous advances in science have made it possible for complex diseases like ADPKD to be better understood. It is possible to see what may be going on inside the cell, and it has been discovered that there are abnormalities in the cells themselves. Specifically, abnormalities in a protein called aquaporin (aqua-porein) have been identified and they will likely play a significant role in future treatment. Specialized genetic testing remains the best way to diagnose ADPKD. In people younger than thirty years of age, doing a kidney ultrasound to look for cysts is not recommended, as it is less sensitive for picking up cysts. If you have a family history of ADPKD, you should speak with your doctor about undergoing genetic testing or further imaging studies. The mainstay of treatment involves tight control of blood pressure. The use of ACE inhibitors and ARBs, when tolerated, is recommended. There is nothing as of yet that will diminish the size of the cysts, but as previously discussed, I believe it is only a matter of time before a treatment is discovered. A small percentage of people with ADPKD can develop aneurysms in the brain called Berry aneurysms. If a family member has had a history of brain aneurysm, then it is recommended that imaging be done to evaluate further. The most common imaging procedure recommended for this is a study called Magnetic Resonance Angiography (MRA). It is important to know the kidney function before going for this study. Right now, there is no definitive treatment for ADPKD. There are some exciting things coming down the pipeline, however. The goal is tight control of blood pressure, which can be difficult as the cysts get bigger and further squeeze the kidneys. When the person's GFR approaches 20 percent, appropriate referrals are made to begin the transplant evaluation and the person is advised regarding dialysis options. If you remember, the kidneys are connected to two tubes called ureters that empty into a large holding tank called the bladder. When the bladder is full, it triggers a reflex for it to empty. The urine then flows through a small tube called the urethra and out of the body. The kidneys, ureter, and bladder together are called the urinary tract. In older men, an enlarged prostate is a leading cause of an obstruction, or blockage, of the urinary tract, referred to as obstructive uropathy. Obstructed or blocked kidneys are a significant cause of kidney disease in older men. To find out more, you can check out Adult Polycystic Kidney Disease.